Today is a pretty special post for me. I was so shocked and honored when I was contacted by Sally Hansen to create a few manicures with some of their beautiful polishes. As I always say anytime I am asked to swatch or create nail art for a brand it's always a mega honor and I'm always flattered. And if you've kept an eye on my manicures then you know I've been a long time fan of this brand, but in particular a lot of my nail art features the Insta Dri line! I use these mainly for stamping since they are opaque and often in brilliant colors that I don't have available elsewhere. 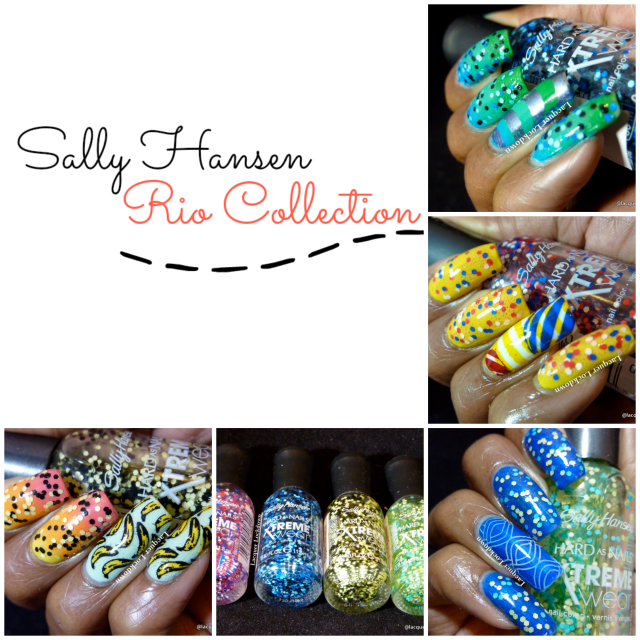 I'll be sharing a few of the new ones later, but today I have select swatches and nail art from the Sally Hansen Xtreme Wear Rio Collection. These polishes are matte glitters contained in a clear base, and as with most matte glitters they represent a great way to create instant nail art. A clear base jammed full of the palest green and blue matte glitter. This one was a favorite for me as any polish that plays with combinations of blue and green are apt to be for me. The formula the glitter eased out of the bottle with no fishing required and flowed over my nails like butter. I was bit surprised since often with glitters this dense you have to really fish around, but that was the opposite case for all four of these glitters. Because this was so yummy looking as a glossy mani I wanted to see what would happen to the depth of the glitter if I mattified it so of course I added a matte topcoat. I loved how that turned out as well! A slightly red tinged clear base polish full of red, white and blue matte circle glitter. When I first saw this polish I it reminded me a bit of the Color Frezny Lime Red, White and Hue except with circle glitters. I really love that polish but for this mani I went in a less patriotic look and instead played up the beachy theme creating an accent of beach balls and blankets. This was the only one that had a bit of a fussy formula and required a tiny bit of patience with laying down the glitters to prevent drag. I realized afterwards that I wasn't as successful with the spread because I ended up with a lot of air bubbles in the clear base. A clear base polish chocked full of matte pale, medium, and dark blue hexagon glitter + matte hexagon black glitter. This one is my favorite of the bunch! It's what I call a super saturated glitter and when I see something like that it just makes me want to squeal. A clear base polish packed full of matte pale yellow, pale green, and black small hexagon glitter. This one is easy to love and easy to wear. I found the glitter eased out and spread over the nail with lo difficulty at all. I didn't even require placement. This is one well formulated polish! To match the mood of this collection I created a festive gradient and added island elements. I like the base so much I decided to show it to you solo :) And in case you didn't know Sally Hansen Insta Dri polishes are near as perfect as a polish can get for creating gradients since they are so opaque and quick drying. I also mattifed this one just to see how it would look. I liked it even more than the glossy version! The Sally Hansen X-treme Wear polishes were sent to me for honest review. All other products used were purchased by me. For more information please see my disclosures policy. You were definitely the person to ask! These manis are all overwhelmingly amazing! !